Hours after running this morning's review of Transformers: War for Cybertron, a package showed up on my doorstep featuring the toy versions of two of the game's Autobot stars. I've been actively seeking these two figures out for a couple of weeks now, just in case they slipped out into stores early. I've been collecting Transformers for years, though once the movies came out my habit slowed considerably, generally limited to small run items and convention exclusives, like last year's Soundwave at the San Diego Comic Con. 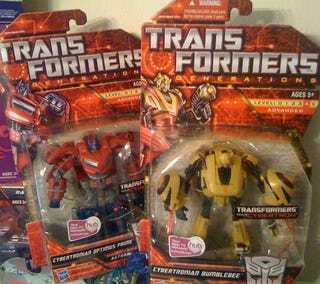 With only two figures in the series for now, Bumblebee and Optimus Prime, the War for Cybertron toys seemed like a good line to hunt for. And then Activision stole all my fun. Thanks, Activision. Still, they're here, and no Transformer in my possession stays in its packaging for long. Anyone fancy a comprehensive review?